Square Cafe is a American, Coffee & Tea, and Tea restaurant where most Menuism users came for fun with friends, paid between $10 and $25, and tipped between 15% to 18%. 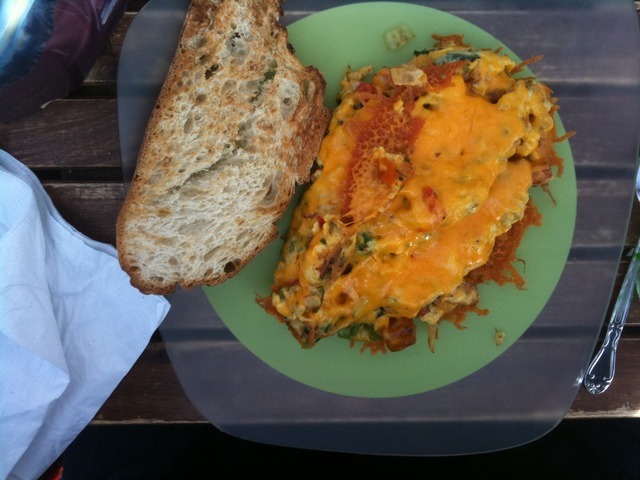 3 reviews of Square Cafe, first by Nase. I’d been hearing so much about this place, that I was anxious to try it. Not sure what all the hoopla is about, really. It will make you think “diner” when you walk in, and the menu is primarily all breakfast/brunch dishes. I tried the breakfast burrito, and it was just okay. I got about halfway through and called it quits. Just kind of bland and nothing I couldn’t have done better at home. The place does get busy, so maybe I need to try another option and see if it fares an better than the first. My beau and I found Square Cafe about a year after moving here. It is another of those restaurants that once you eat there, you keep coming back every weekend. That is just what we did. Their specials are always tempting and the atmosphere just can’t be beat. Be prepared to wait if you come during peak hours – they shut down around 3ish. It’s an awesome place to bring your dog to brunch with you on warm sunny days as most of the neighborhood does. They believe in fresh ingredients and it is reflected in the food. It always looks as good as it tastes. This tasty dish is a crowd pleaser. The green of the green eggs comes from fresh pesto mixed with some tasty cheese. The ham is no small piece either. An all together treat Seuss would love. It was the name that did it. I’m a true sucker for marketing strategies. Put your product in a pretty shaped container and I’m all for it. Give you product a unique name, and I’m your customer. That’s what happened with Square Café’s dish, Hopple Popple. It could have very well been made with entrails, and I would likely have still ordered it. Perhaps popple reminded me too much of my favorite childhood toy. And as I started reminiscing on my old loveable purple plush animal, that could be folded into a ball and then, like magic, Pop out again, I decided it was worth trying the meal that was deemed special enough to hold the name Popple. The Popple was very similar in style to an omelet without the fluffiness. It was filled with diced potatoes, cheese, ham, peppers, onions, spinach, and mushrooms. Even with all those ingredients I felt it was missing something. Rosemary would have added just the right twist of savoriness need to make hopple popple truly pop! Still I enjoyed the atmosphere of Square Café. Our waiter was patient and polite even when extra guests showed up at later times. One thing that I honestly enjoyed was the plate and glassware. The color and styles were fanciful and bright. 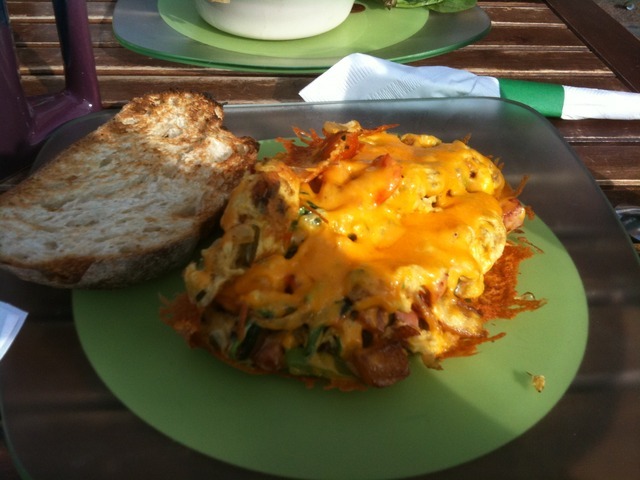 Square Café is definitely on my list for a return visit. These dishes from the Square Cafe menu are contributed by Menuism users directly, as part of a restaurant review, or as part of a photo upload. An American food lover from New Kensington, PA tried Dorido's Restaurant . A diner from Pittsburgh, PA tried Moe's Southwest Grill in Downtown. A Chinese food lover from Pittsburgh, PA tried Amazing Wok, liked it, and rated it . They liked the food, liked the service, and liked the ambiance. A dining patron from US tried Green Front Inn in Southside Flats. A Chinese chowhound from Pittsburgh, PA tried Jimmy Wans Restaurant & Lounge. A dining patron from Pittsburgh, PA tried Ron's Pizza Palace in Troy Hill. A diner from Pittsburgh, PA tried Dave & Andy's Homemade Ice Cream in Central Oakland. A Sandwiches food lover from US tried Subway in Downtown, liked it, and rated it . They liked the food, liked the service, and liked the ambiance. Do you own Square Cafe? Contact us to connect with your diners. Square Cafe is located near the cities of Pgh, Downtown, Mount Washington, Strip District, and Mt Washington. People found this by searching for: Square Cafe, Square Cafe In Pittsburg, Square Cafe Pittsburgh, Square Cafe Menu Pittsburgh, Square D Cafe Pittsburgh, Square Cafe In Regent Square, Square Cafe Pittsburgh Menu, and Square Cafe Pitsburgh Hours.